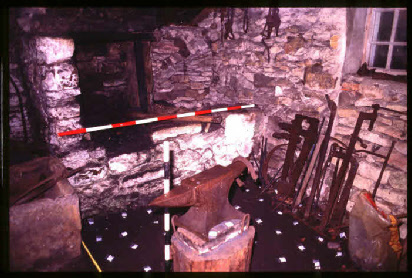 Most sites produce some evidence of smithing, in the form of slag etc, but few actual smithy structures have been identified. Early medieval smithies have been excavated at Hamwih, (Southampton), Wharram Percy, (East Yorkshire). The smith plays a significant role in early medieval texts, for example in early Irish stories (see Scott, B. Early Irish Ironworking), the sagas. In most cases these texts refer to high status weapons smiths rather than ‘the village smith’.